Dear Mr. President: Please Don’t Negotiate Over the Debt Ceiling. Please. So far as I can tell, there’s only one hint of trouble in how Obama has approached the fiscal cliff: the debt ceiling. The administration’s initial ask included a proposal for getting Congress out of the business of raising the limit so as to avoid the kind of fiasco that the GOP instigated last summer. At first it seemed like the sort of maximalist demand tossed in for purely symbolic reasons—in this case, to signal an official end to presidential wussiness. But the background chatter suggests the administration is serious about folding the debt-limit into the current negotiations in order to secure at least a one-off increase. The president seemed to reiterate the point in his first post-election television interview on Tuesday. And yet this logical-sounding calculation doesn’t really hold up. There is, for one thing, the cost. By insisting on extending the limit as part of the fiscal-cliff deal, Obama is destined to end up with either substantially less of what he wants (revenue, stimulus) or substantially more of what he doesn’t (cuts to spending, especially to entitlement programs). As John Boehner archly observed when Obama first raised the issue, “There is a price for everything.” There’s simply no way you make a demand the other guy considers painful during a negotiation like this without compensating him for it in the end. Of course, Boehner’s demands might be an acceptable price to pay if it were the only way to avert another one of the doomsday scenarios that keeps Durbin awake at night. After the midterm elections in 2010, Geithner’s own chief of staff proposed folding the debt-limit issue into the lame duck negotiations that were ongoing at the time. (See my recent book on Obama’s economic team for more on this.) Given that the GOP had just given the president’s party a painful electoral beat-down and had real leverage, that was a reasonable strategy for avoiding the quagmire that ensued 2011, even if it would have meant a lousier deal than the one the administration eventually hammered out. But this time around the situation couldn’t be more different. It’s the president who’s just won a sweeping mandate and the Republicans who are on the defensive. There’s simply no way that, less than two years after Republicans very nearly forced the country to default, the House leadership is going to push things to the brink all over again. It’s not like it played out so well for them the last time around, with the public disproportionately blaming the GOP for the debacle. And this time, voters will be even less tolerant of these games for precisely the reason Durbin mentions: We will likely have just been through a drawn-out, wrenching, publicly contentious negotiation over the fiscal cliff. Boehner, for one, seems to understand that allowing his party to be led by its most unhinged elements isn’t a recipe for success. On Monday, he bounced three of the most conservative House GOP freshmen from their committees because they’d bucked him too often--hardly the actions of a man keen to set himself on fire to retain the Tea Party’s respect. All of which points to an obvious debt-ceiling strategy for Obama: Make minimal effort to defuse it during the fiscal cliff negotiation. Once that’s resolved, simply announce to Boehner that you have no intention of bargaining over raising the limit—that whether Boehner wants to flirt with another financial crisis or calmly ease the increase through the House is entirely his choice. I guarantee he will not choose option A.
Democrats will worry that Obama doesn’t have the backbone to see this strategy through. After all, it requires accepting the chance, albeit vanishingly small, that the GOP does in fact plunge us into the abyss, a level of brinkmanship Obama has generally shrunk from in his first term. But there is at least one instance of Obama holding firm in a situation like this. During the final debt-ceiling negotiations in July of 2011, Republicans were adamant about only raising the debt ceiling for a few months. Obama said “no deal.” He insisted that the ceiling be extended past the 2012 election, so that the GOP wouldn’t be able to shake him down all over again. Geithner pleaded with him to accept the shorter-term deal and at least postpone the crisis. But Obama understood that allowing the GOP to renew its threats during the campaign would set a terrible precedent, and he eventually got his way. The same goes in this instance. Obama is shrewd enough to see that failing to break the GOP’s attachment to debt-limit thuggery will completely upend the balance of power between the president and Congress. Indeed, while addressing a group of business executives on Wednesday, Obama warned that, “If the Congress in any way suggests they are going to tie negotiations to the debt ceiling and take us to the brink of default once again as part of a budget negotiation… I will not play that game because we’ve got to break that habit before it starts.” I have faith that he can hold the line to kill off this destructive precedent once and for all. 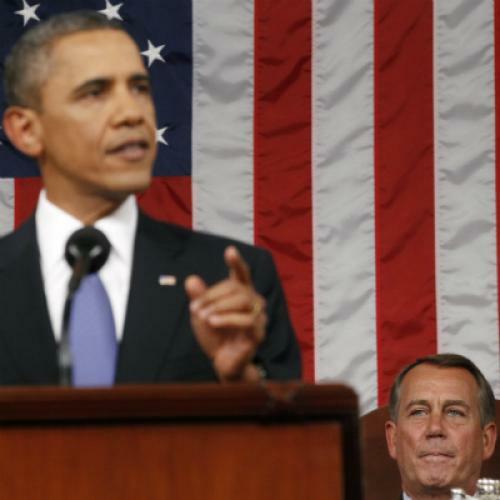 All the more so given how weak Boehner’s position will actually be. In the end, Boehner really has nothing—not just on the fiscal cliff, where Obama’s leverage is obvious thanks to the expiration of the Bush tax cuts, but also when it comes to the debt limit, which Obama can make disappear like the bad dream it is. Like any good negotiator, Boehner is of course trying to turn that nothing into something. But that’s no reason the administration should do his work for him.